Corporations can generally deduct interest on debts for federal tax purposes. A valid obligation exists if the parties intended to create a debt, and the debt is enforceable and unconditional. In contrast, a capital contribution is a direct or indirect contribution of cash or other property to the capital of a business entity. Generally, a contribution to the capital of a corporation isn’t treated as taxable income to the corporation, and the contributor can’t deduct the payment for tax purposes. The issue of whether certain corporate instruments should be classified as debt owed by the corporation or as an equity interest in the corporation (the equivalent of stock) has been around for many decades. Internal Revenue Code Section 385, which was put in place in 1969, authorizes the IRS to issue regulations to address this question. However, no final regulations have ever been issued. So the debt vs. equity issue has evolved based on court decisions issued over the years. There are two recent developments on this issue: 1) a recent U.S. Tax Court decision, and 2) long-awaited Sec. 385 regulations that will generally take effect for tax years ending on or after Jan. 19, 2017. Here are the details. In a recent decision, a corporate subsidiary of a U.S. corporation purchased a partnership interest from a Liberian corporation in exchange for a 10-year note. The note had a fixed interest rate of 12%. It also provided for additional interest based on cash flow from the partnership interest. At the time of the purported purchase, the taxpayer’s corporate subsidiary had no assets and required an advance of the entire purchase price from the seller (seller financing). In reality, the purported fixed interest payments were solely dependent on cash flow from the partnership interest (the asset that was purportedly purchased with the seller financing). The terms of the note were later amended to provide for a reduced interest rate. The IRS denied the taxpayer’s interest expense deductions, claiming that the purchase of the partnership interest by the subsidiary was financed with equity rather than debt. In other words, the partnership interest was contributed by the Liberian corporation to the capital of the subsidiary. The IRS has never issued final regulations under Internal Revenue Code Sec. 385 even though it has been around since 1969. However, in corporate inversion transactions (which have become popular amid heavy criticism from some quarters), multinational corporations often use a technique called “earnings stripping” to minimize U.S. taxes. Specifically, the taxable income of the domestic corporation is stripped away by payments of deductible interest to the new foreign parent or one of its foreign affiliates domiciled in a country with lower tax rates. Needless to say, the IRS doesn’t like this strategy. In April 2016, the IRS issued proposed regs to clarify when to treat an instrument as corporate debt or corporate equity in certain transactions between related corporations. After receiving numerous comments, the IRS issued final and temporary regulations in October 2016. The new regulations are included in a Treasury Decision, which is a daunting 518 pages long. But, in a nutshell, they essentially restrict the ability of corporations to engage in earnings stripping by treating financial instruments that are purported to be corporate debt as corporate equity in certain circumstances involving loans between related corporations. In addition, the new regulations require borrowing corporations that claim interest expense deductions for certain loans from related corporations to provide documentation of the loans. Because the ability to minimize income tax liabilities through the issuance of related-party financial instruments isn’t limited to cross-border scenarios, the new regulations also apply to related U.S. affiliates of a corporate group. The updated rules generally go into effect for tax years ending on or after Jan. 19, 2017, subject to certain transition rules. 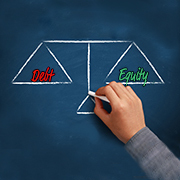 The debt vs. equity issue has heated up. But most of the heat focuses on purported debt transactions between related corporations, especially when the purported lender is a foreign corporation. Therefore, many corporations won’t be affected by the new regulations. If you have questions or want more information on this important issue, consult a WFY tax advisor at info@cpa-wfy.com. The extent of the purported creditor’s participation in management of the purported borrower.